The Book Chook: Let’s Celebrate Screen-Free Week, 2015! 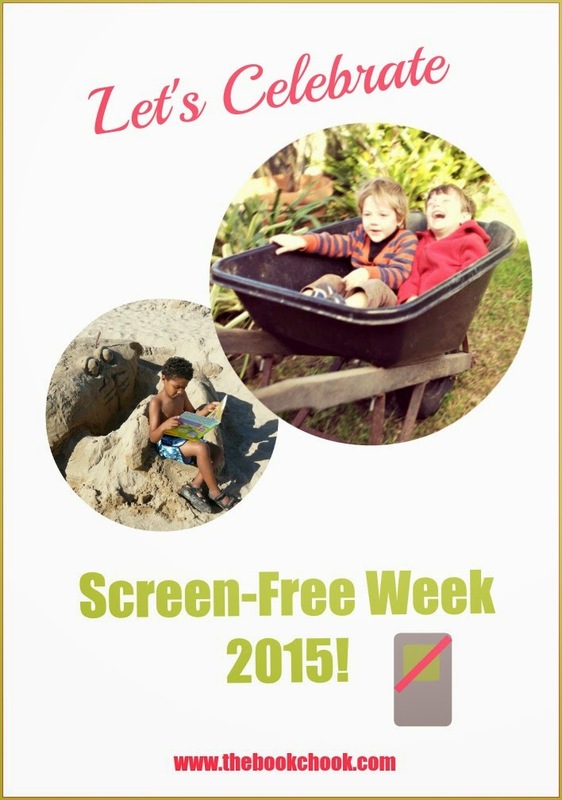 Let’s Celebrate Screen-Free Week, 2015! Screen-Free Week will be held from May 4 to May 10 in 2015. Why is Screen-Free Week important? Lots of families, schools and communities use this week to remind themselves to switch off screens and spend time together doing other things. As our lives become increasingly entangled with, and dependent on screens, I think it’s vital to take regular stock of screen time. How long do we spend reading text messages, chats and emails? How much time do our kids spend with a screen? Does our family spend time together without any screens being involved? How long? Is that what we want? Are we all so busy that there’s no time for daydreaming, watching clouds, playing pretend? Screen-Free Week prompts us not only to examine our relationship with screen-based activities, but to celebrate the enormous benefit of activities unrelated to screens. Some people rediscover the fun of playing card games and board games together in the evenings. Some people dedicate daily time for a family walk and chat after dinner perhaps, or go to a nearby park to fly kites. Others look forward to taking turns to read aloud from favourite books. This is not a week to send kids off to do extra homework! The emphasis is on reminding ourselves and our kids just what a joy it is to spend quality time with each other that doesn’t involve a screen. * Explain the concept to your kids. Enlist their ideas and enthusiasms to make the whole thing work for you. It’s NOT a punishment, and any group or family has the right to configure and schedule Screen-Free Week so it works out for them. Maybe it will be a challenge or a competition? Maybe kids can log screen-free hours to earn something special? Maybe it will only be one day at your school, or each evening for a week for your family? * Organise your week ahead of time and include as many wonderful events and activities as you can. Give children some things to look forward to for the week. Yes, allow plenty of time for doodling and moodling, cloud-watching and dreaming, but let's also include candlelight picnics, new games, LEGO building, fort or cubby building, campfires, sports or whatever is suggested by those involved. * Look for new board games and library books you think your kids will enjoy and have them ready for Screen-Free Week. Old friends are great too, but something new can make things even more exciting. Or learn some new games you don’t need equipment for. Look inside my Book Chook Bag of Tricks for some I like, or check out two of my favourite silly games. There are useful resources for those who want to organize a community or other event at the Screen-Free website, plus lots of things to think about before, during and after you participate. Whatever you decide to do during Screen-Free Week, I hope you and your children/students reap the benefits of lots of fun and less technology-focussed days! I’ll be adding this special day to my List of Important Special Days for Kids.